As might be inferred from my last post, certain sporting matters have been on my mind of late. However, as is becoming rather a theme on this blog, these have also generated some business-related thoughts. On Friday evening, the Australian cricket team finished the second day of the second Test Match on a score of 152 runs for the loss of 8 (out of 10) first innings wickets. This was still 269 runs behind the England team‘s total of 425. In scanning what I realise must have been a hastily assembled end-of-day report on the web-site of one of the UK’s leading quality newspapers, a couple are glaring errors stood out. First, the Australian number 4 batsman Michael Hussey was described as having “played-on” to a delivery from England’s shy-and-retiring Andrew Flintoff. Second, the journalist wrote that Australia’s number six batsman, Marcus North, had been “clean-bowled” by James Anderson. I appreciate that not all readers of this blog will be cricket aficionados and also that the mysteries of this most complex of games are unlikely to be made plain by a few brief words from me. However, “played on” means that the ball has hit the batsman’s bat and deflected to break his wicket (or her wicket – as I feel I should mention as a staunch supporter of the all-conquering England Women’s team, a group that I ended up meeting at a motorway service station just recently). 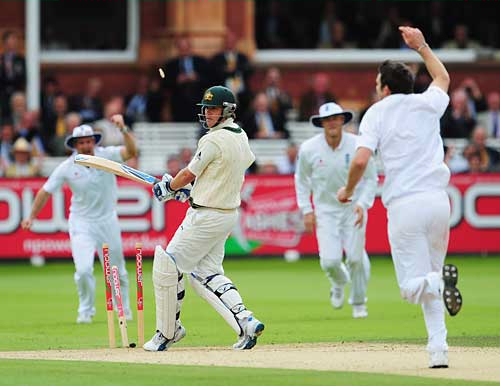 By contrast, “clean-bowled” means that the ball broke the batsman’s wicket without hitting anything else. If you are interested in learning more about the arcane rules of cricket (and let’s face it, how could you not be interested) then I suggest taking a quick look here. The reason for me bothering to go into this level of detail is that, having watched the two dismissals live myself, I immediately thought that the journalist was wrong in both cases. 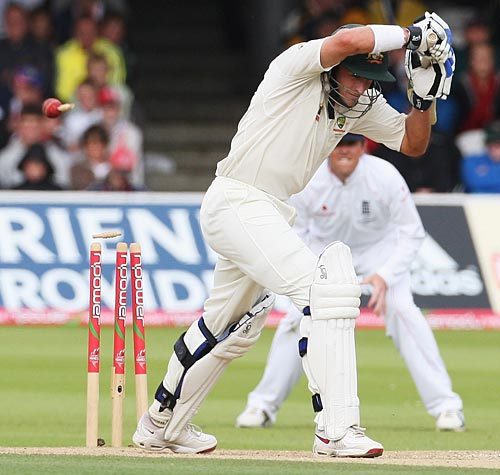 As hopefully many readers will be able to ascertain, Hussey raised his bat aloft, a defensive technique employed to avoid edging the ball to surrounding fielders, but misjudged its direction. It would be hard to “play on” from a position such as he adopted. The ball arced in towards him and clipped the top of his wicket. So, in fact he was the one who was “clean-bowled”; a dismissal that was qualified by him having not attempted to play a stroke. North on the other hand had been at the wicket for some time and had already faced 13 balls without scoring. Perhaps in frustration at this, he played an overly-ambitious attacking shot (one not a million miles from a baseball swing), the ball hit the under-edge of his horizontal bat and deflected down into his wicket. So it was North, not Hussey, who “played on” on this occasion. So, aside from saying that Hussey had been adjudged out “handled the ball” and North dismissed “obstructed the field” (two of the ten ways in which a batsman’s innings can end – see here for a full explanation), the journalist in question could not have been more wrong. As I said, the piece was no doubt composed quickly in order to “go to press” shortly after play had stopped for the day. Maybe these are minor slips, but surely the core competency of a sports journalist is to record what happened accurately. If they can bring insights and colour to their writing, so much the better, but at a minimum they should be able to provide a correct description of events. Everyone makes mistakes. Most of my blog articles contain at least one typographical or grammatical error. Some of them may include errors of fact, though I do my best to avoid these. Where I offer my opinions, it is possible that some of these may be erroneous, or that they may not apply in different situations. However, we tend to expect professionals in certain fields to be held to a higher standard. For a molecular biologist, the difference between a 0.20 micro-molar solution and a 0.19 one may be massive. For a team of experimental physicists, unbelievably small quantities may mean the difference between confirming the existence of the Higgs Boson and just some background noise. In business, it would be unfortunate (to say the least) if auditors overlooked major assets or liabilities. One would expect that law-enforcement agents did not perjure themselves in court. Equally politicians should never dissemble, prevaricate or mislead. OK, maybe I am a little off track with the last one. But surely it is not unreasonable to expect that a cricket journalist should accurately record how a batsman got out. I made something of a leap from these sporting events to the more tragic news of Michael Jackson’s recent demise. I recall first “hearing” rumours of this on twitter.com. At this point, no news sites had much to say about the matter. As the evening progressed, the self-styled celebrity gossip site TMZ was the first to announce Jackson’s death. Other news outlets either said “Jackson taken to hospital” or (perhaps hedging their bets) “US web-site reports Jackson dead”. By this time the twitterverse was experiencing a cosmic storm of tweets about the “fact” of Jackson’s passing. A comparably large number of comments lamented how slow “old media” was to acknowledge this “fact”. Eventually of course the dinosaurs of traditional news and reporting lumbered to the same conclusion as the more agile mammals of Twitter. In this case social media was proved to be both quick and accurate, so why am I now going to offer a defence of the world’s news organisations? Well I’ll start with a passage from one of my all-time favourite satires, Yes Minister, together with its sequel Yes Prime Minister. Hastings: Things might get out. We don’t want any more irresponsible ill-informed press speculation. Hacker: Even if it’s accurate? Hastings: Especially if it’s accurate. There is nothing worse than accurate irresponsible ill-informed press speculation. Was the twitter noise about Jackson’s death simply accurate ill-informed speculation? It is difficult to ask this question as, sadly, the tweets (and TMZ) proved to be correct. However, before we garland new media with too many wreaths, it is perhaps salutary to recall that there was a second rumour of a celebrity death circulating in the febrile atmosphere of Twitter on that day. As far as I am aware, Pittsburgh’s finest – Jeff Goldblum – is alive and well as we speak. Rumours of his death (in an accident on a New Zealand movie set) proved to be greatly exaggerated. The difference between a reputable news outlet and hordes of twitterers is that the former has a reputation to defend. While the average tweep will simply shrug their shoulders at RTing what they later learn is inaccurate information, misrepresenting the facts is a cardinal sin for the best news organisations. Indeed reputation is the main thing that news outlets have going for them. This inevitably includes annoying and time-consuming things such as checking facts and validating sources before you publish. […]the much-ballyhooed Twitter swiftly degraded into pointlessness. By deluging threads like Iranelection with cries of support for the protesters, Americans and Britons rendered the site almost useless as a source of information—something that Iran’s government had tried and failed to do. Even at its best the site gave a partial, one-sided view of events. Both Twitter and YouTube are hobbled as sources of news by their clumsy search engines. Much more impressive were the desk-bound bloggers. Nico Pitney of the Huffington Post, Andrew Sullivan of the Atlantic and Robert Mackey of the New York Times waded into a morass of information and pulled out the most useful bits. Their websites turned into a mish-mash of tweets, psephological studies, videos and links to newspaper and television reports. It was not pretty, and some of it turned out to be inaccurate. But it was by far the most comprehensive coverage available in English. The winner of the Iranian protests was neither old media nor new media, but a hybrid of the two. Aside from the IT person in me noticing the opportunity to increase the value of Twitter via improved text analytics (see my earlier article, Literary calculus? ), these types of issues raise concerns in my mind. To balance this slightly negative perspective it is worth noting that both accurate and informed tweets have preceded several business events, notably the recent closure of BI start-up LucidEra. Also main stream media seem to have swallowed the line that Google has developed its own operating system in Chrome OS (rather than lashing the pre-existing Linux kernel on to its browser); maybe it just makes a better story. Blogs and Twitter were far more incisive in their commentary about this development. Considering the pros and cons, on balance the author remains something of a doubting Thomas (by name as well as nature) about placing too much reliance on Twitter for news; at least as yet. Some business thoughts leaked into the final paragraph of the Introduction above, but I am interested more in the concept of accuracy as it pertains to one of my core areas of competence – business intelligence. Here there are different views expressed. Some authorities feel that the most important thing in BI is to be quick with information that is good-enough; the time taken to achieve undue precision being the enemy of crisp decision-making. Others insist that small changes can tip finely-balanced decisions one way or another and so precision is paramount. In a way that is undoubtedly familiar to regular readers, I straddle these two opinions. With my dislike for hard-and-fast recipes for success, I feel that circumstances should generally dictate the approach. There are of course different types of accuracy. There is that which insists that business information reflects actual business events (often more a case for work in front-end business systems rather than BI). There is also that which dictates that BI systems reconcile to the penny to perhaps less functional, but pre-existing scorecards (e.g. the financial results of an organisation). A number of things can impact accuracy, including, but not limited to: how data has been entered into systems; how that data is transformed by interfaces; differences between terminology and calculation methods in different data sources; misunderstandings by IT people about the meaning of business data; errors in the extract transform and load logic that builds BI solutions; and sometimes even the decisions about how information is portrayed in BI tools themselves. I cover some of these in my previous piece Using BI to drive improvements in data quality. However, one thing that I think differentiates enterprise BI from departmental BI (or indeed predictive models or other types of analytics), is a greater emphasis on accuracy. If enterprise BI is to aspire to becoming the single version of the truth for an organisation, then much more emphasis needs to be placed on accuracy. For information that is intended to be the yardstick by which a business is measured, good enough may fall short of the mark. This is particularly the case where a series of good enough solutions are merged together; the whole may be even less than the sum of its parts. A focus on accuracy in BI also achieves something else. It stresses an aspiration to excellence in the BI team. Such aspirations tend to be positive for groups of people in business, just as they are for sporting teams. Not everyone who dreams of winning an Olympic gold medal will do so, but trying to make such dreams a reality generally leads to improved performance. If the central goal of BI is to improve corporate performance, then raising the bar for the BI team’s own performance is a great place to start and aiming for accuracy is a great way to move forward. A final thought: England went on to beat Australia by precisely 115 runs in the second Test at Lord’s; the final result coming today at precisely 12:42 pm British Summer Time. The accuracy of England’s bowling was a major factor. Maybe there is something to learn here.